A great intro to web mapping! I was thinking just the other day when someone asked, why were there not updated Google Maps API books out there. People like to read books, right? I mean, reading API pages is boring even for devs. 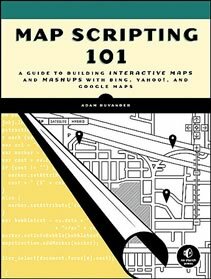 I saw a review a couple weeks ago of Adam Duvander’s book, Map Scripting 101 and jumped at the chance to read it. Anyway, enough about Mapstraction and on to Adam’s book. Adam starts off with some simple maps built on a couple APIs, but quickly gets into how you can use Mapstraction to simplify it. Once he gets beyond the intro to creating maps with these APIs, he gets into some samples that should get the attention of those who this book was written for. He hits on some classic mapping examples such as weather and earthquakes, but then gets into some Twitter and music event stuff that was a refreshing change from typical web mapping books. And you better believe there was a coffee shop example that used some cool geocoding and routing stuff. Adam also got into some of the formats that are important to web mappers; GeoRSS, GeoJSON, KML and even threw in a MySQL example. Word of caution though, you’ll want to have some MySQL background before trying as there wasn’t much background there (and probably rightly so). The Map Scripting website has all the examples ready to go if you want to be a copy and paste coder. The one thing about the whole book though is that it is clear that Adam is a great writer who is excited about technology and it shows. The book is very accessible for beginners and even intermediates who might want to get more familiar with Mapscraction. Adam should be very proud of his book as I think he’s done a superb job on it. I hope he’ll continue writing technology books because his style is needed in a normally very drab and boring space. I’d wager most readers of this blog will gain a ton of benefit from reading this book if they want to learn more and apply some of the fun things you can do with web mapping.